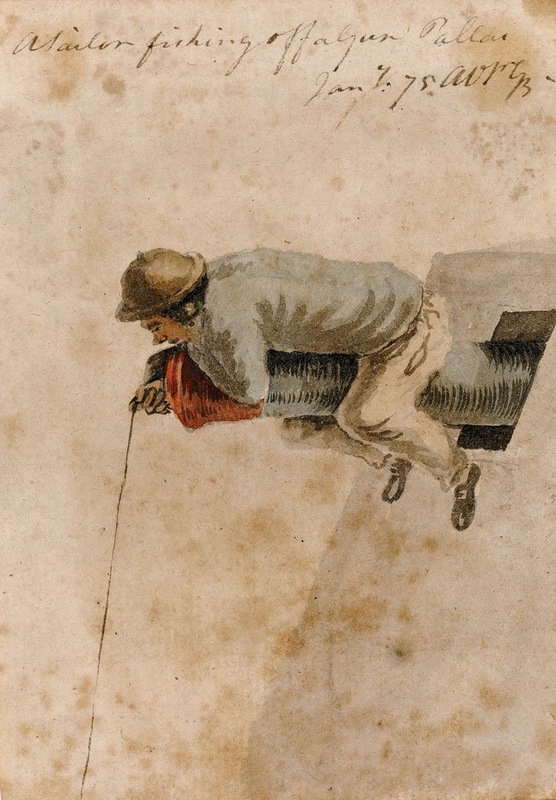 "A seaman fishing off a gun" is yet another of the Serres series done while aboard the Pallas and in the collection of the National Maritime Museum. This sailor wears a brown Monmouth/Dutch cap with a thick round brim. His hair is cut short and the angle doesn't give us a hint of his neckcloth, shirt, or waistcoat. This seaman's jacket is a light blue, ending at the waist and without pockets, though we can't see if it is double or single breasted, nor the cuff style, much less what buttons he'd be wearing. His trousers are the fairly standard white affair ending above the ankle. The stockings are presumably white, but the angle makes it hard to tell. His shoes are round toed with rectangular buckles. There isn't much here that we wouldn't expect, but it's a fun little image of a sailor consumed in a recreational activity, rather than the popular images of spending money, drinking, smoking, chasing girls, and getting into fights.